Medical Waste Disposal | WellBeing Midwest | Serving KC and beyond! Specializing in medical waste removal and disposal, WellBeing is dedicated to exceeding our customer's’ needs and expectations. With a focus on customer service, our mission is to be the reliable, cost-effective and expert choice in medical waste services. We operate our own processing facility located in Overland Park Kansas and not only meet, but exceed, all federal, state, and local standards. The treatment of medical waste, in our case a steam sterilization and maceration technology, constitutes a method for rendering materials non-infectious prior to disposal. Our processing capabilities guarantee complete sterilization of treated wastes, reduce environmental impacts of this material, while limiting potential HIPAA liabilities through maceration. Furthermore, our energy efficient treatment process generates no odors or pollutants of any kind which helps us to be a good neighbor in our community. Our tracking procedures ensure that our clients medical waste is handled safely, efficiently, and per all applicable regulations, so you can spend less time worrying about your waste and more time delivering quality patient care. Regulated medical waste must be contained within rigid containers which meet certain performance standards and regulatory approvals. These containers are designed and must be prepared for shipment in a manner which limits the potential for exposure if involved in an accident. Protecting our clients from sharps and bio-hazard waste is our commitment. Medical waste is generated at healthcare facilities, such as hospitals, physicians’ offices, dental practices, blood banks, and veterinary clinics, as well as medical research facilities and laboratories. Medical waste generally refers to all solid wastes produced at a healthcare facility, whereas regulated medical wastes includes materials that require special management. 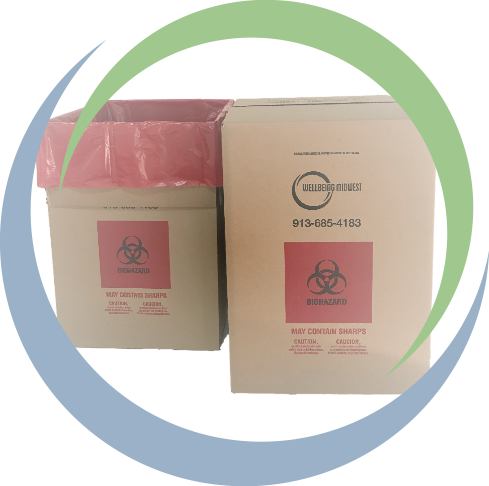 Regulated medical waste is healthcare waste that may be contaminated by blood, body fluids, or other potentially infectious materials. Medical waste is frequently referred to as biohazardous waste, biomedical waste, clinical waste, other potentially infectious material (OPIM), potentially infectious medical waste (PIMW), or through its United Nations classification number, UN 3291. If your organization is in need of a reliable, convenient, eco-friendly and cost-effective way to dispose of medical or biohazardous waste, contact the experts at Wellbeing Midwest! Video is copyrighted and is used with permission of the copyright owner. The benefits of SSM processed waste? It is sterilized, safe and no longer recognizable as medical waste. Therefore, it can be recycled or disposed of as ordinary municipal trash. Unlike medical waste incinerators and autoclaves, SSM processing is free of unpleasant odors and does not release any negative air emissions. It is more environmentally friendly and less costly than any other on-site medical waste management alternative. Within 30 minutes, they system softens the waste while the particles are simultaneously surrounded by superheated water and steam until sterilization is achieved. Most bio-hazardous waste processors only disinfect waste; We guarantee sterilization with our process. Pharmaceutical waste items that can be placed in a non-controlled/non-hazardous pharmaceutical waste container.